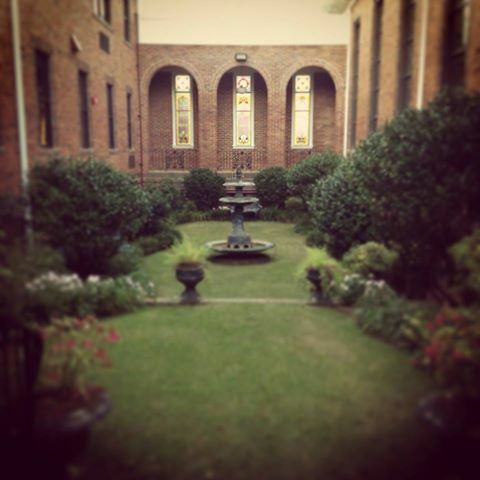 There is a beautiful courtyard in McRae, Georgia, that most people don’t see—unless you are a member of the McRae United Methodist Church or have visited the church for a wedding or funeral or some such event. Tucked between the building housing the sanctuary and the two story Sunday School building the garden has delighted the many who have seen it. When the church was built, there was a space approximately forty by seventy feet that was vacant. The two buildings were attached, front and back, by a wall that gave the impression of one large building. A walkway was built to allow the congregation to move from one building to another without having to brave the weather outside. The unfinished area between the two buildings provided an inspiration for the current pastor’s wife, Mrs. J. M. Glenn around 1937. The pastor, Rev. J. M. Glenn, came to what was then the McRae Methodist Church in 1935 to serve as its pastor. This courtyard was the dream of one woman, made possible through the inspiration and generosity of another woman with whom she shared the dream. This dream culminated in the transformation of a bare and ugly spot into a gem of rare beauty, which is a joy to the church, the community, and especially to the members of the Lyonia Garden Club of McRae, who were privileged to have a part in the beautification of this spot. 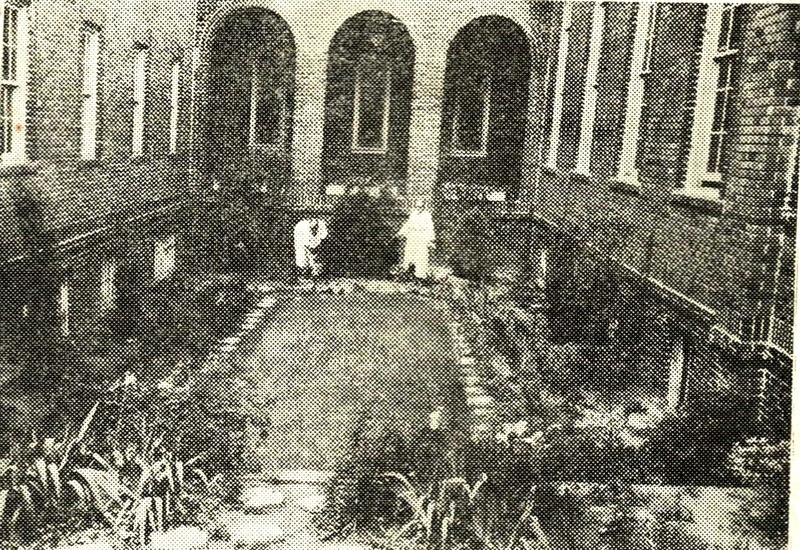 When Mrs. J. M. Glenn first saw the courtyard that linked the church with the educational building, she had visions of what its development would mean in soul culture, so she enlisted the help of Mrs. T.J. Smith, Sr., a senior member of the Lyonia Garden Club, who was a genius at rooting cuttings and growing rare plants from seeds and who had developed a nursery of her own. Mrs. Glenn contributed beautiful German Iris that was transplanted from her old home in New Jersey. Many other plants were donated, not only by Mrs. Smith, but from other members of the club. These plants were used as foundation plantings included: four Camellias japonicas: one Chinese magnolia, ten hydrangeas, four azaleas: three rosedale arbor vitas: seven variegated euonymus: six euonymus: fifteen nandinas: two variegated junipers: fourteen pittosporum: four hawthorne: five lucidum ligstrum: two golden rain trees: two Anthony Waterer spireas: one banana shrub: fifteen arbor vitas: one forsythia: one flowering quince: ten abilias: two star jasmine: one Japanese Plum: two crape myrtles. The plants, most of which were several years old, were valued at $200. Other plants, amounting to $40 were given by Mrs. Smith and others, as prizes to the consolidated schools in Telfair County making the best contribution to the a recent Temperance parade staged by the woman’s Christian Temperance Union. Today, the courtyard at the McRae United Methodist Church is a source of pride for the congregation as well as a picturesque location for weddings and receptions. A flowing fountain was added several years ago which adds more charm. Remnants of the original plants can still be found in the courtyard if one knows how to find them. The picture above was taken from the Telfair Enterprise in 1937 and shows stepping stones leading down from the street end of the courtyard. Today, there are steps at the back leading down to the courtyard. The street end is completely closed in and is not accessible from that end. It must be noted that the Lyonia Garden Club of McRae won the second prize, a silver trophy, for civic projects at the convention of the Garden Clubs of Georgia held in Rome in 1937. The honor was won through Mrs. T.J. Smith, Sr., an honorary member of the Garden Club, and the untiring efforts of Mrs. J. M. Glenn, who conceived the idea of the project which won the trophy. Visitors are welcome to view the courtyard and can gain access to it by calling the church office. The photograph below was taken in 2014. It shows the courtyard as it is today. The Pioneer Historical Society is a 501 (c)(3) organization whose mission is to sustain the interest of the county's citizens in the preservation of the county's history and to encourage interest in the arts. The Telfair Museum of History and the Telfair Center for the Arts are also integral parts of The Society. The Pioneer Historical Society meets the first Wednesday of each month at 11:30 am at the Fairway Restaurant at the Little Ocmulgee State Park. After a dutch meal, a short program of area interest is presented after which a short business meeting is held. Everyone interested in the history of Telfair County and the surrounding area is urged to join. Membership are $10 per year for individuals. Family and business memberships are available. For more information contact Robert E. Herndon, President, at 229-868-2520 or by email at rherndon2002@yahoo.com or from any member of the Pioneer Historical Society. You are encouraged to visit our website at www.phshistory.org .